I’m the kind of person that loves defending my guilty pleasure movies, especially the 2004 action/fantasy/horror film Van Helsing. There are certain movies that you have to go in to and just forget about all the rules and be able to switch your brain off for a little bit. Those are some of my favorite kinds of movies, and Hansel and Gretel: Witch Hunters definitely falls into the brainless category. Here’s the thing, this certainly can’t be objectively classified as a “good movie.” Sure. What I can personally classify it as is a new guilty pleasure that could have used just a little bit more energy. 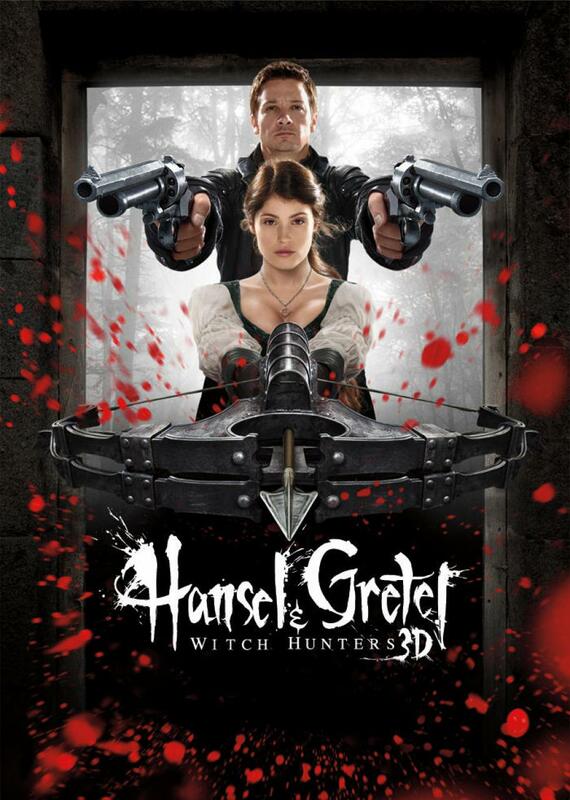 After surviving a traumatic encounter with a witch in her house of candy (we’ve all heard the story), Hansel (Jeremy Renner) and Gretel (Gemma Arterton) dedicate their lives to hunting down and slaying witches. It’s a bloody business, but somebody has to do it, and they just so happen to do it well. After being hired by the town’s mayor, the duo arrive in Augsburg to take on a job to catch a group of witches that have been taking children from the town. What starts out as a run of the mill mission for the two witch hunters ultimately turns into something completely different when they learn that they are dealing with a grand witch named Muriel (Famke Jannsen), who has powers far greater than anyone they’ve ever faced. As blood continues to be spilled by the gallons, Hansel and Gretel gear up for their final confrontation with Muriel, and a more mysterious confrontation with their own past. So let’s just get the obvious out of the way. Hansel and Gretel: Witch Hunters is not meant to be taken seriously, and anyone who tries to take it with even an ounce of seriousness will begin nitpicking at the most unimportant little flaws, and therefore miss the point of the entire movie. The film’s writer/director, Tommy Wirkola, is no stranger to the world of ridiculous movies. After all, he’s the guy who made Dead Snow and its sequel. This is a movie that is meant to be viewed as just a silly way to escape from reality for a short while, and the movie does its job… sort of. Alright, yeah, it could’ve been better. I’m gonna start with the negatives, because they’re just no fun at all. Some of the writing in this movie is shockingly awful, and I’m not talking about the one liners. I love the one liners. I’m talking about the characters and their interactions with one another. As the movie progressed and the action scenes would take a break, the characters seemed like they were trying to develop and form relationships with one another, but it just never happened. This made it hard to care about when something good or bad happened to anyone. Even if you aren’t meant to take a movie seriously, you still have to care about what happens. There were also a few characters that were wasted before they even had the potential to do anything. It would’ve been cool to see Hansel and Gretel team up with a few more people to take down this gang of witches, but I’ll take what I can get. Finally, Famke Janssen’s acting got a liiiiiiiittle too annoying for me to handle at points. She just doesn’t pull of the “over the top evil” thing as well as others. Let’s be real though, this is a movie I’m going to remember and have fun talking about, because it’s a movie that looked like it was a blast to write and even more of a blast to make. There’s style in every inch of this movie. It’s steam punk meets a Grimm fairy tale, complete with exploding heads, some excellent make up, and Gemma Arterton… I love this woman. Anyway, what I’m trying to say is that this movie is a treat (no pun intended). I feel like in a world of remakes and reboots, it’s cool to see a completely unique twist on something that is very well known, a twist that is packed to the brim with imagination. You can sort of feel Wirkola’s passion about this film leaping off the screen. This is a movie he wanted to make, and it shows, even though there are major flaws. Despite the flaws, you have to admire the attention and focus that Wirkola seemed to put into making his vision come to life. 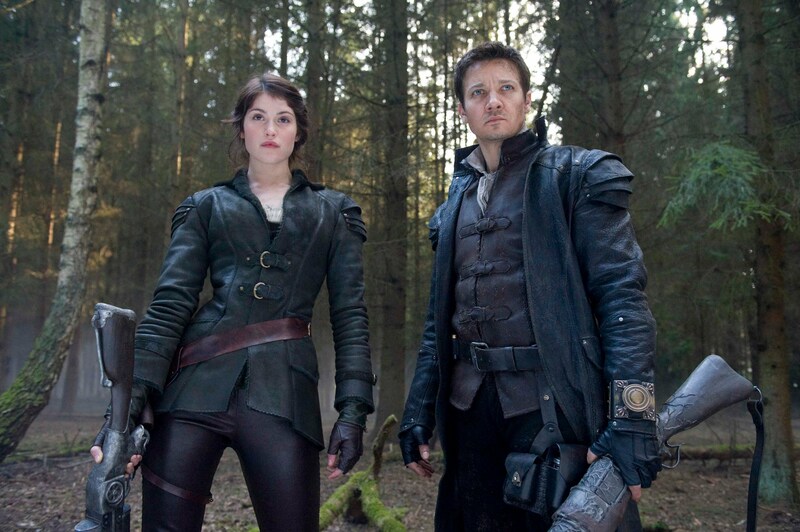 Hansel and Gretel: Witch Hunters is not a movie that’s going to be forgotten too soon, like it or not. I can almost guarantee that in ten or twenty years time, people will still be using it as an excuse to create a new drinking game, and those people have the right idea. This is a movie made purely to entertain, no matter how you watch it. There’s a lot of sloppiness splattered throughout the entire hour and a half run time, but the movie never loses its fast pace and its sly, self aware sense of humor. If you go into this movie expecting to hate it or expecting anything that is going to challenge your cinematic sensibilities, just relax. Remember how to have fun, just for a little bit, and you might just have a good laugh. There’s movies that come out once every so often that grab you by the head and makes it loud and clear that you are watching a work of greatness. Fortunately for Pixar, they’ve done that quite a bit with the Toy Story films, Monsters Inc., and Up. 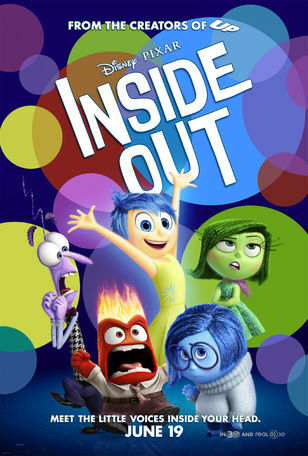 I’m proud to say that they’ve done it again with their latest film, Inside Out. I didn’t know a lot about what the movie was about going into it other then the basic idea of it, nor was I extraordinarily excited about it, but this movie completely blew me away and will have me thinking for weeks. Riley Anderson (Kaitlyn Dias) is a normal young girl with loving parents who one day has to undergo a move from her house in Minnesota, leaving her hockey team and friends behind, to San Francisco. While normally keeping things under control in her mind’s control room, Riley’s emotions begin spiraling out of control not being sure on how to handle something like this. Joy (Amy Poehler) is getting increasingly worried that Sadness (Phyllis Smith) is going to turn all of Riley’s “core memories” into sad ones, which she doesn’t need at this point in her life. This clash of interests sends Joy and Sadness on a journey through Riley’s mind, leaving Anger (Lewis Black), Fear (Bill Hader), and Disgust (Mindy Kaling) in charge. While Joy and Sadness work to get Riley’s life back on track, the other emotions may inadvertently cause her to do something drastic. While Toy Story and it’s sequels appealed to kids who obviously love their toys and Monsters Inc. let kids face their fears in a humorous way, I’m not very sure that Inside Out will stay with kids as much as it will teenagers and adults. This movie deals with complex human emotions using different personifications and metaphors to explain them, that I feel only people who is of the age to wrap their head around these ideas are going to feel the overwhelming happiness and appreciation that I have for this movie. Like the emotions and processes of though that it is personifying, this is actually a pretty complex film. What other movie can you say actually had its characters ride the Train of Thought? That’s only one example of the fine creativity that is at work here. There’s another great scene where a few of the characters enter the realm of abstract thought, resulting in some great animation but also unusually intelligent psychological banter. Really, the whole world of Riley’s mind is a place to behold. It’s so colorful and full of movement and different mind employees that there are plenty of things to laugh at and enjoy onscreen at any one moment. It’s no surprise that this movie looked so beautiful, considering Pixar has never really made an ugly movie. 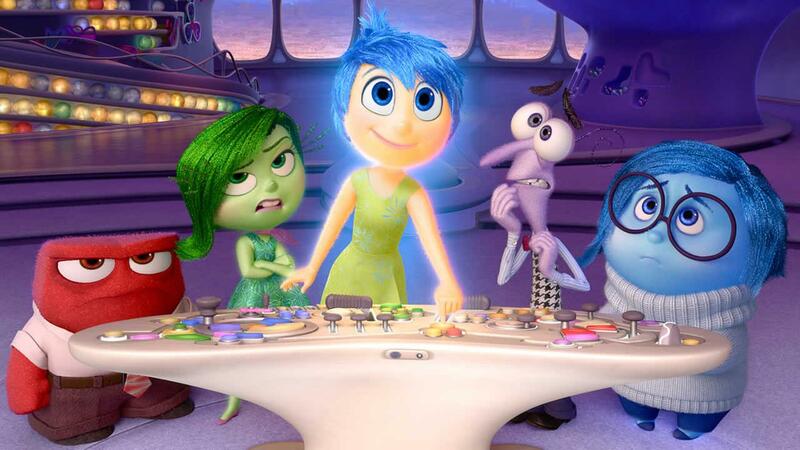 Once again, like all of the emotions of Inside Out, your own emotions will run the gauntlet. This is promise you. Remember the first 15 minutes or so of Up? The movie doesn’t quite hit you that hard, but the sadness that you feel is a kind of nostalgic sadness. There are moments in this movie where you’ll look back on your own childhood and remember feeling a way that is shown in the movie. In that same vein, however, this movie will make you laugh, and laugh a lot. How extreme the emotions act with each other is such a joy to watch along with all of the mental puns thrown throughout. Also, the fact that Anger is always reading a newspaper can’t be a coincidence. It’s a perfectly casted movie with nearly perfect writing. Simply put, Inside Out is probably going to be one of the best films I’ll see this entire year, and definitely one that’s destined to be a classic. I don’t mean that just for animated movies, but for movies in general. While I can’t say it’s exactly for kids, I’m sure kids will really enjoy the movie, but adults are going to have the times of their lives with this movie. It’s undeniably smart, highly emotional, and just completely beautiful. It would be a sin to miss out on this film, so please don’t. In 1954, Toho released a movie called Gojira that would completely reinvent an entire genre. Since then, Godzilla has become King of the Monsters and also a household name. In 1965, to keep up with what Toho was putting out, Daiei Films put another monster on the market, Gamera, which has become a respected kaiju, but is nothing compared to Godzilla. So while Daiei was known for its monster Gamera, it was also known as the production company that put Akira Kurosawa on the map with his 1950 samurai film Rashomon. 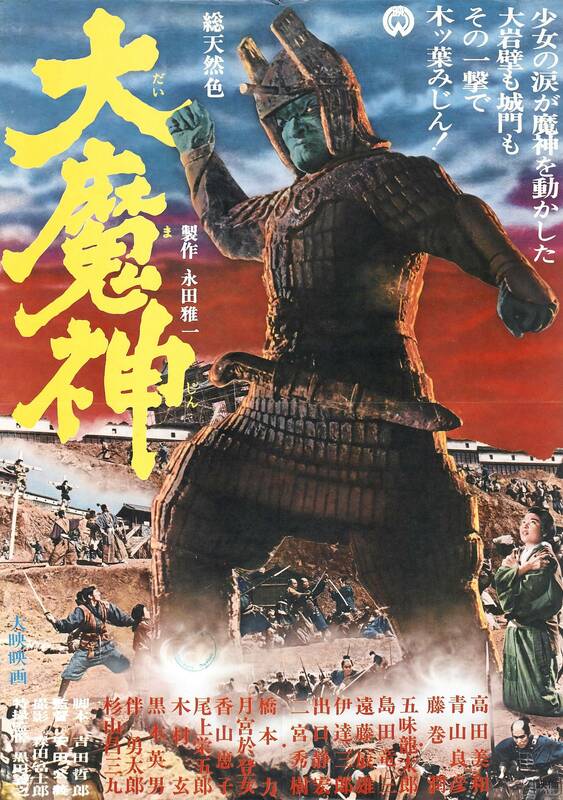 Now, what if you take Daiei’s monster movies and COMBINE them with samurai movies. What would be the result. Well, that almost unthinkable result would be the Daimajin trilogy. The first film, Daimajin, tells the story of a Japanese village that is taken over by an evil chamberlain, Samanosuke (Yutaro Gomi), who forces the villagers into slave labor. After years of turmoil, the mountain god Daimjin is called upon to bring Samanosuke to justice and restore order in the land. In Return of Daimajin (or Daimjin Ikaru), Daimajin must once again be restored to life to stop a war between a violent warlord and the surrounding villages, before any more loss of life is had. In Daimajin Strikes Again (or Daimajin Gyakushu) Daimajin is brought to life by three young boys who witness their family being forced into labor camps to construct rifles for a warring faction, a problem that Daimajin can surely fix in one afternoon. For any fan of Japanese film, there’s quite literally nothing to dislike here. It seems like a weird combination of genres, but it works out for the best. There’s so much cool stuff in all three of these movies, it’s hard to just pinpoint a few instances. The scene where a group of soldiers try to dismantle the statue before it comes to life ends with such a bang when the statue begins to bleed and a wild storm comes blowing through. That’s just the first time I laughed with excitement at the events that were to unfold. There’s also a lot of excellent religious symbolism that can be recognized no matter what faith you are, kind of like the bleeding statue. It adds a cool layer of the supernatural amongst everything else. All three movies have pretty much the same basic structure. There are a group of good and religious villagers just trying to live their lives and respect their mountain god (Daimajin). Of course, that would make for a boring movie, so there is always an evil samurai or lord that shows up that either wants to kill or capture the villagers. While it can get a little repetitive, there is no outstanding reason to have to watch all of these movies in a row in order. There’s no continuing plot and everything is always set up like it is in the first film. This allows you to watch whatever film you want in whatever order you want, and appreciate them as stand alone movies. So after all of the drama of the story plays out and we really grow to hate the villain, the films switch gears and it all suddenly turns into a giant monster movie. That’s like…the best thing that could happen to any movie. 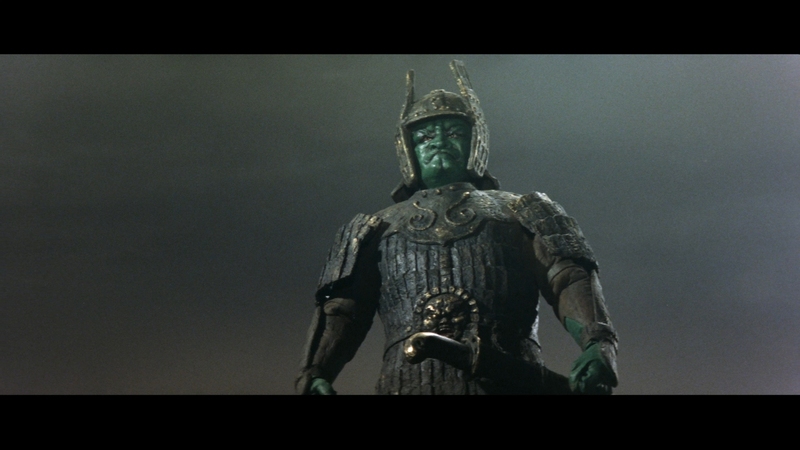 Daimajin is a great giant monster, even though he’s technically a mountain god in the form of a statue. He’s a kaiju that thinks and recognizes good and evil. The actor’s eyes are seen, which never really happens in a monster movie. This gives Daimajin a healthy dose of personality and makes him stand out amongst all of the other hard hitters like Godzilla, Gamera, and Mothra. Daimajin and its two sequels are all very solid and impressive examples of Japanese film in the mid 1960s. Between Toho and Daiei, there was just a huge flow of monster after monster, and I don’t think Daimajin gets the credit that he deserves. He’s a damn cool monster, and these movies also work great as period dramas. Anyone who is a fan of these kinds of kaiju movies, or even movies like Seven Samurai, Rashomon, and the Lone Wolf and Cub film series should definitely check this trilogy out. It’s almost too much fun. Since 1993, the Jurassic Park franchise has taken audiences into a world where dinosaurs once again rule parts of the earth, making us humans feel remarkably small. The first entry is obviously the strongest and arguably one of the most important blockbusters of all time, ushering the future of computer generated effects. The two sequels both held their own, in my opinion, to the original and created a very solid trilogy of movies. Now we have the fourth entry, Jurassic World, boasting a name that promises everything to be bigger and better. Well, almost at least. Sort of? Being the ultimate proof that people will just never learn, the company InGen has finally opened the first ever dinosaur themed park, featuring rides, exhibits, and shows. Claire Dearing (Bryce Dallas Howard), the park’s operations manager, practically works around the clock making sure everything runs without fail, even if it means putting off spending time with her nephews that have come to visit and see the park with her. Today is a special day for her, however, with the newest project being officially given the green light for park use, a genetically modified dinosaur named Indominus rex. 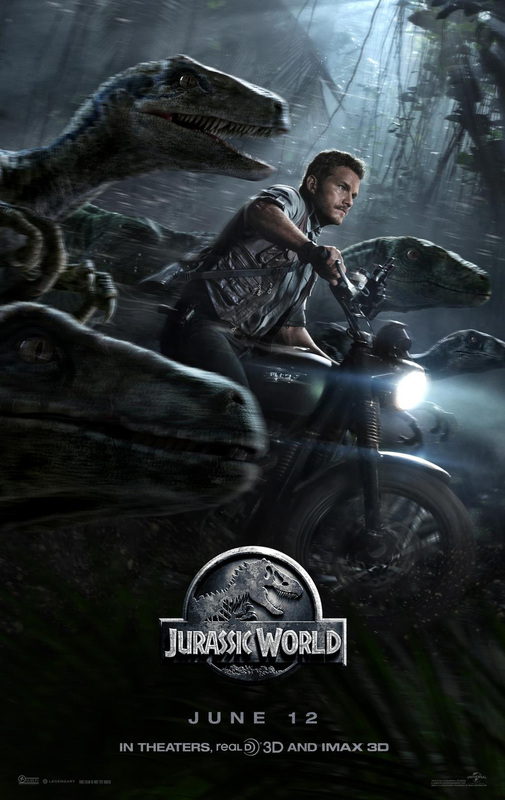 What no one realized it that this dinosaur is not only highly intelligent, but hell bent on killing, and after it escapes, Claire looks to the Velociraptor trainer, Owen Grady (Chris Pratt) to devise a plan to stop it or even kill it. What can I say about this movie? I guess first off I can say that, overall, it was pretty good. It may be a fault of my own in thinking that when I’m watching a movie in the Jurassic Park series, I don’t expect it to just be “pretty good.” This movie has broken multiple international records, beating both The Avengers and Harry Potter and the Deathly Hollows: Part 2 for box office sales. It’s easy to see why. It’s Jurassic World and we haven’t seen another movie in this groundbreaking series for 14 years. Unfortunately, the actual movie, other than the excitement to see it and the nostalgia factor, doesn’t really deserve to be breaking any records. I want to talk about the positives to this movie first, because there certainly are some to be had. 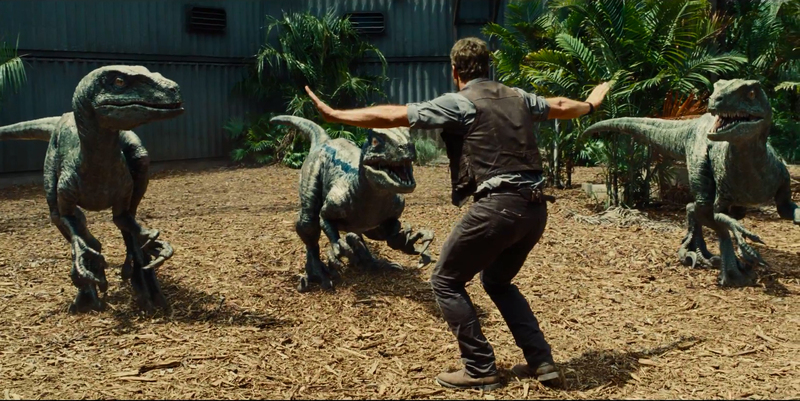 First of all, the whole plot involving Christ Pratt’s character training raptors is a really cool idea and is actually believable. There’s also really tense and exciting scenes with the Indominus rex breaking out and hunting other dinosaurs or people trying to stop it. Seeing its giant head peek out of the camouflage before attacking its victims is classic for this film series. Pretty much all of the scenes involving dinosaurs are great, and the huge dinosaur throw down as the climax is like the ultimate payoff to a movie like this. Surprisingly, there were also some really great uses of practical effects for closeups, and the CGI worked to tell the story, instead of the CGI being the story. Where this movie fails, and fails hard, is the writing. It’s painful to hear some of the lines spoken in this movie, and I sort of feel bad for the actors who really had to try their best to make them work. Sometimes really cheesy dialogue is written into a movie as a self aware sort of joke, but I believe that everything that was said in Jurassic World that falls into that category was meant to be taken seriously. Not only was the dialogue poorly written, but so were most of the characters. Bryce Dallas Howard isn’t fleshed out enough and Vincent D’Onofrio’s character is just…weird. Finally, Owen Grady doesn’t really get all that important until about 50 minutes into the movie, and he’s the most interesting character. For a while we’re left with two dimensional characters and two kids who are anything but interesting. Jurassic World is a movie that could definitely have been better, and I don’t claim to be any sort of expert but it’s pretty glaring how some of the flaws are, mainly in the writing. There’s a lot of action and plenty of memorable scenes with all of the dinosaurs, but there’s a period of about 30 minutes where I just didn’t care about what was going on because the characters were so bland. I’m not saying that this is a bad movie, but I’m not saying it’s a great movie. For what it is, this is a pretty good movie with some great scenes, but don’t expect it to meet you expectations at all. What happens when you have action film master Luc Besson and combine his talents with gravity defying parkour and limb snapping martial arts? The result is an action movie that seems to have been forged by the gods for the gods, high on top of Mount Olympus. 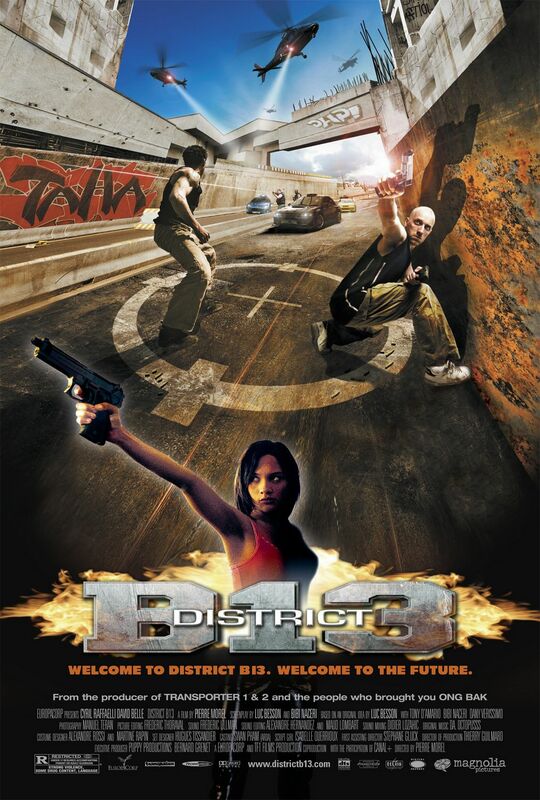 District B:13 is a prime example of how action films should be made, and like many action movies, it got a sequel. District 13: Ultimatum is also a marvel because it’s a sequel that actually compliments the first film well instead of just getting pooped out in the name of money. Let’s start in 2004 with District B:13. 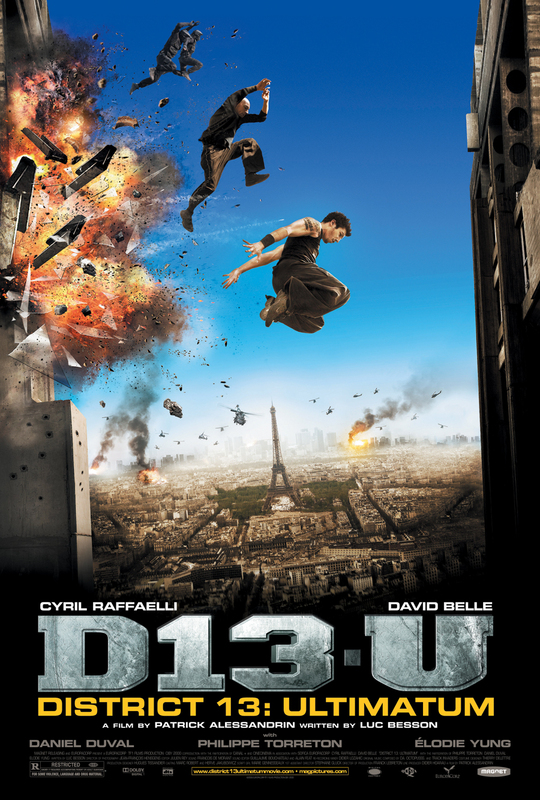 In the not too distant future of 2010 (remember this movie was made in 2004), the French government constructs a wall around a particularly violent ghetto, District 13. Three years later, most government run buildings and organizations, including the police, have disappeared from the ghetto leaving the people to fend for themselves. Leïto (David Belle) is a “criminal” from the ghetto who spends his days fighting against the gangs that run the city. When he finally gets mixed up with drug lord Taha (Bibi Naceri), his sister is taken and turned into an addict. Leïto soon meets police officer Damien (Cyril Raffaelli), who has a mission to infiltrate Taha’s gang to procure a neutron bomb that belongs to the government, but is set to go off within 24 hours. Taha wants the bomb, Leïto wants his sister back, and Damien wants to complete his mission, so the two team up to bring Taha’s reign of terror to an end and save Banlieue 13 from certain destruction. This movie is, in my definition, a perfect action film. It’s fast, over the top, and well edited and shot. The parkour scenes flow together very smoothly thanks to Pierre Morel’s direction and steady hand behind the camera. The film editing also works with the kinetic movement of the characters and the narrative, jumping from scene to scene with chaotic precision. The stunts were also all choreographed by one of the costars, Cyril Raffaelli, and his work is out of this world. Not only are the action scenes some of the most unique martial arts you’ll see, but the parkour literally seems to defy gravity at times. There’s so much to look at and laugh in amazement. District B:13 pretty much has everything you’d want in an action movie. I’ve heard complaints that the story is pretty weak, and I’d have to agree that it does have a very weak story. Let’s be honest though, I wanted to watch this movie for the action and the stuntwork and some cool cinematography. That’s exactly what I got, and the story is passable with a pretty strong message at the end. This is a movie I’ll be sure to watch over and over again. After waiting three years for law and order to finally come to District 13, Leïto recognizes that it may never come and still works at bringing down corruption wherever he finds it, from police to drug lords. Leïto soon finds himself in the possession of a video that proves corruption on a massive scale stemming from the government’s sort of private secret service. Damien, who is needed out of the picture, is placed in jail and is in need of Leïto’s help. As if breaking out of jail wasn’t hard enough, they are soon faced with a much bigger problem. The leader of the the department titled DISS, Walter Gassman (Daniel Duval) is working to get the president (Philippe Torreton) to bomb sectors of District 13 to create a new section of high rise apartment buildings and businesses. As you can probably surmise from that summary, this sequel is a lot more intricate and complex than its predecessor, which isn’t necessarily the best thing for a movie like this. What made the first film such a success was the acrobatics and well choreographed fight scenes, not an overly complex story of interdepartmental corruption. Sure, that was part of it, but it didn’t completely take over the movie. Do not get me wrong, though, this is still a superior action movie. The fight scenes are still completely off the wall, if not as skillfully shot and there is even a great use of vehicular stunt work, which was probably the most memorable part of the movie. District 13: Ultimatum doesn’t quite match the level that the first film did, but it is a worthy sequel. The action and choreography gets a little bit bogged down with a convoluted story that sometimes works, sometimes doesn’t, and feels a bit recycled at the same time. It was still great seeing the two protagonists teaming up again to save District 13 once again. The simplicity of the story worked well in the first one by allowing it to keep up a fast pace. This one is not as fast or exciting, but still worth a watch. District B:13 and District 13: Ultimatum are great examples of how to properly do an action movie, and even how to construct a sequel that doesn’t feel forced. This is why I consider Luc Besson to be the king of the action genre and that the best action movies do seem to mostly stem from Europe. Sometimes I watch a movie and I think, “How am I ever going to write a review for this?” Unfortunately, here I am today with that very same problem. Teruo Ishii is not a director with no credits, in fact his filmography is rather large and he is getting his material from a popular comic book artist, Yoshiharu Tsuge. What could go wrong here? It’s a movie that prides itself on being weird and exists solely to knock your socks off. Unfortunately, this movie is a failure on most levels. For two years, cartoonist Tsube (Tadanobu Asano) and Kuniko (Miki Fujitani) have lived together, and for those two years, Tsube has had very little work which results in very little money. After finding out that Kumiko had a one night stand and may now be pregnant, his self esteem reaches an all time low and he leaves her to travel around the countryside and hopefully find himself. While he travels, he meets a strange amount of people with obsessive or suppressed sexual urges, which makes him explore a side of himself that he never knew. When he gets an unexpected and life threatening injury, however, the world turns into a different sort of place where no one is willing to help him. This is probably going to be a short review because I really don’t have much to say. Screwed feels so broken and dull that it hardly even qualifies as a movie you watch. It’s more like a movie you sleep through. Like, what was this movie trying to be? It’s this weird combination of an honest exploration of a depressed man’s mind, but then it’s also this acid trip down a hellish rabbit hole. Unfortunately, it doesn’t do either one well enough for me to be remotely interested in either. Screwed didn’t work for me at all. The only time it got remotely cool was the last twenty minutes, and those parts all felt forced, like the film makers had to do something weird for its audience to respect it in some way. I know I say this a lot, but for a movie like this, it would have worked better as a short film around 45 or 50 minutes in length. It goes on for way too long and offers nothing of substance. Bottom line: It’s stupid and ugly so don’t watch it. I apologize for the quality of this review, but I really didn’t have much material to work with. There’s nothing online about this movie to clarify certain things or add decoration, so this is the best I can do for everyone. Until next time! The gangster genre of film is arguably one of the most interesting to choose from when you want to watch a movie. Not only are there always tough decisions and crime on a massive scale, but you can also learn a lot about a culture depending on what you watch. 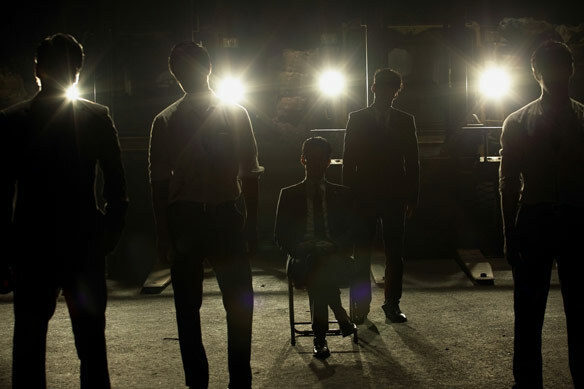 New World is a gangster movie from South Korea that combines the styles of The Departed, The Godfather, and even some of Oldboy to craft a story that is full of twists, turns, betrayals, and violence. If you can’t already tell, I loved this movie. 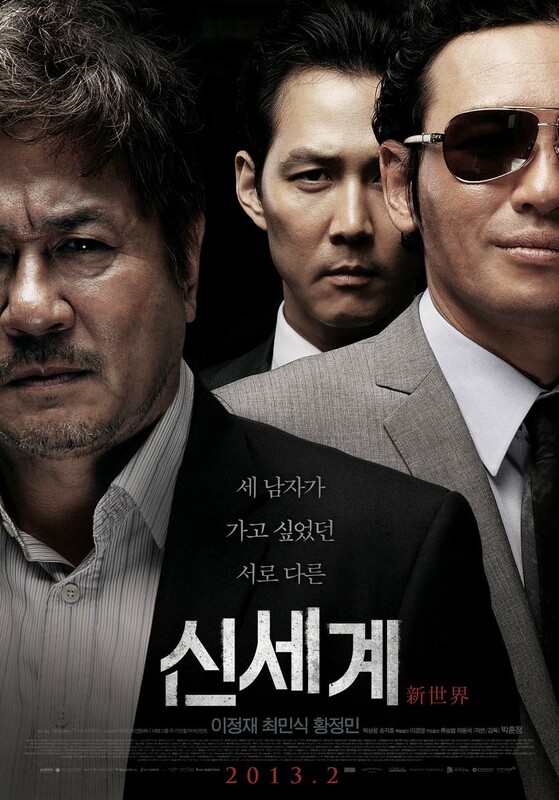 Ja-sung (Lee Jung-jae) is a top level gangster in South Korea’s largest syndicate, Goldmoon. Ja-sung is also a police officer who has been posing as this gangster for eight years, slowly making his way up the totem pole. After the head of Goldmoon is killed in a car accident, Ja-sung believes that his job is done, but his boss, Chief Kang (Choi Min-sik) goes back on his word and forces him to continue with the syndicate in order to bring it down for good. The mission, titled Operation New World, is to pit Jung Chung (Hwang Jung-min) and Lee Joong-gu (Park Seong-woong) against each other, both of whom are possible candidates to take over as boss. As true motives start to become clearer and clearer, Ja-sung has to decide where his loyalty lies, whether it’s with the corrupt police or the criminalized syndicate. When it comes to telling a story, conflict is one of the most important ingredients. To me, if there’s no good conflict, there’s no good story. New World, fortunately, has a lot of great conflict. In fact, you sort of get double the conflict. The whole story is told through the eyes of Ja-sung, an undercover cop who has slowly found himself becoming one of the gangsters that he is trying to stop. Right away, the criminals won’t be on his side. The police aren’t on his side either because they just want him to finish the mission no matter what so they can take all of the credit for taking down the syndicate. This clash between two powers makes for some pretty incredible character dynamics. Along with the excellent character dynamics between the police and the gangsters, Ja-sung, himself, is a complex and interesting protagonist. I love seeing characters who are normally in control of every situation begin to be pushed way too far to the point where they have to do something drastic. Think Sam Peckinpah’s Straw Dogs. His character works very well with the other antagonists, like Chief Kang with the police and Lee Joong-gu in the syndicate. Every scene provided new opportunities for a plot twist or some kind of betrayal, and the tension that builds becomes really intense as Ja-sung’s character gets pushed farther and his identity risks exposure. I believe that South Korean movies are some of the most beautifully shot films you or I will ever see. New World isn’t exactly anything to lose your mind over, but there were plenty of scenes where the camera work went above and beyond what would normally be asked for in a gangster movie. There’s one scene in particular where a fight is shot from overhead inside an elevator. There’s about 7 people fighting in this one elevator, and the camera seems to move in the same way that they do shooting down on them. It made the scene so much more effective, and did so throughout the entire movie. New World is a very well crafted gangster thriller that is superior to many others that are put out. It’s character dynamics and strong sense of conflict keep the movie moving, but also the sense that anything can happen, including the breakdown of the protagonist makes it that much more interesting and watchable. Anyone who is a fan of The Godfather or The Departed will find a lot to love in New World.